One of the most important details about our custom T Shirts is the shirt that you choose to put your special design on. The right color is certainly significant, especially if you are requesting a team uniform or school T Shirts that need to match the school colors or each other. Our pocket tee is a comfortable choice and one that is popular for use with our custom T Shirts printing. It comes in a wide range of colors and you can choose whether you prefer 50/50 or 100% cotton. Our pocket t shirts are a good choice for any of our custom printed shirts. They work for photo shirts by supplying a solid, smooth background for your favorite pictures or for those shirts that you are having customized with graphics. If you are having a function for your business, special event, or for your school group, coordinating custom business T Shirts will make it easy to identify every member of your team. Let us print with your business name, logo, or special message that will let every member of the event know who they can talk to about the business you represent. With adult sizes from Small to 3X, you can fit the same shirt to almost anyone in the group. When you order our photo T shirts or printed custom tee shirts, you have the choice of downloading your custom art work on the shirt of your choice. The pocket tee is a comfortable design that is often enjoyed because of the handy front pocket. You also have the option of getting just the number of shirts you need, even if it is for a small event. The great thing about ordering our custom T shirts online is that you get to choose what the design is from start to finish, all from the comfort of your computer. You can create unity, support your favorite school team, or give your business a professional edge. The pocket tee is a good choice for the most casual occasions or for those where you want to impress your customers with your professionalism. 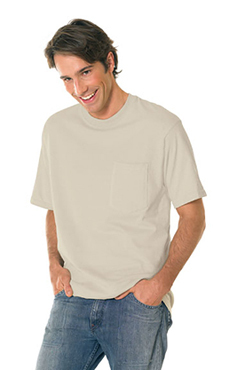 This pocket tee can come in 50/50 or 100% cotton available in a wide variety of colors with a handy front pocket. Pocket Tees can come in 50/50 or 100% cotton and a wide verity of colors.